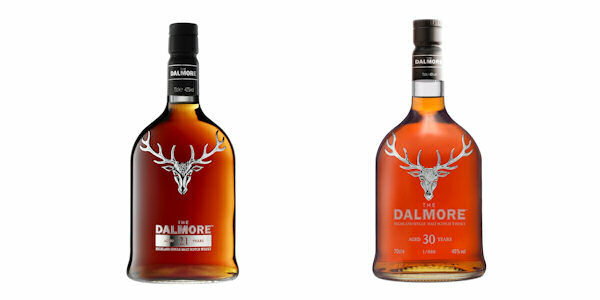 The Dalmore Highland Single Malt is to release two limited edition expressions. “The Dalmore 21” and “The Dalmore 30” are exemplary showpieces of The Dalmore house style created by Master Distiller Richard Paterson. The Dalmore 21 is initially matured in American white oak and finessed in hand-selected first-fill Matusalem oloroso sherry butts from the Gonzalez Byass bodega in Jerez de la Frontera. With indulgent flavours of orange fondant, brand snaps, fresh coffee, chocolate ganache and marmalade this 21 year old single malt is an outstanding example of The Dalmore house style. Only 8,000 bottles of this limited edition whisky will be available. The Dalmore 30 is an assemblage of precious liquids that have been nurtured in hand-selected Matusalem oloroso and Amoroso oloroso sherry butts from the world renowned Gonzalez Byass bodega in Spain for 30 years. The result is a decadent nose of cherries, raisins and apples, a palate of sweet mangoes, panna cotta, Columbian coffee and honeyed mulled wine and a robust finish of coconut blancmange, cracked black pepper and rich dates. This stunning whisky is limited to only 888 bottles each of which have been individually numbered. Richard’s experience and innate understanding of whisky has taught him respect for the passage of time, his meticulous attention to detail is coupled with a rare ability to select the finest finishes and fills that means each whisky The Dalmore creates is a work of art. The Dalmore 21 and The Dalmore 30 will be on sale globally, with The Dalmore 21 available from exclusive outlets from 18th September, and The Dalmore 30 will follow in October. UK retailers include The Dalmore Distillery at Alness, Ross-shire, Scotland, IV17 0UT as well as The Whisky Shop, Harrods and a selection of whisky & spirits specialists.